Unified Solution for MS SQL Database Recovery across All Versions. * Free download to repair SQL database & preview recoverable SQL server database objects. The software incorporates powerful repair algorithms to fix all database corruption issues of your MSSQL .mdf and .ndf files and recovers valuable database components.Stellar Repair for MS SQL recovers database objects such as Views, Stored Procedures, Tables, Triggers, Collations, Indexes, Functions, Primary Keys, Foreign Keys, Unique Keys, & Identity, Defaults & Default constraints, and User Defined Data Types. Stellar Repair for MS SQL is embedded with advanced algorithms that offer recovery of deleted records and tables. The comprehensive scanning routine finds out every bit of accidentally deleted SQL data from the repaired MDF file and saves in a new file with the same name along with an added prefix and lists just under the original repaired file. With software, you can effectively repair both primary database (.MDF) file (containing all data in the database objects) and secondary database ('.NDF') file (comprising all user data). The MDF File and NDF file recovery tool assures you complete SQL Database Repair by fixing SQL database corruption and related errors. The SQL recovery software allows choosing the desired objects from the database for recovery. With this advanced tool, you can reduce the overall recovery time and effort that would be otherwise required to recover the entire database. You can save the recovered objects to a new database file at a user-specified location. The software accurately repairs the inaccessible SQL database file and allows you to save in multiple formats. You can either create a new database file at a desired destination to save the repaired MDF file or select an existing database after entering the required credentials. Additionally, you can save the repaired SQL file in MSSQL, CSV, HTML, and XLS format. Using this SQL Server recovery tool, you can get a glimpse of the actual results beforehand by previewing all the recoverable database objects in the main interface. This feature of the software lets you verify data through the preview; and evaluate the software prior to going for any actual recovery and saving at desired location. The MS SQL data recovery software is fully compatible with Windows 10, 8, 7, Vista, 2003, XP, 2000 and Windows Server 2008/2012. 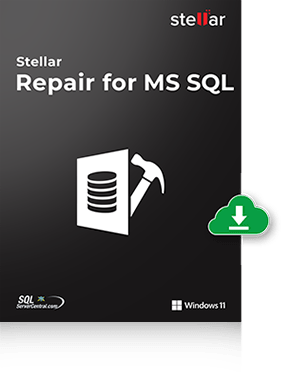 Stellar Repair for MS SQL supports MS SQL Server version: 2017, 2016, 2014, 2012, 2008 R2, 2008, 2008*64, 2008 Express, 2005, 2005*64, Express, 2000, 2000*64, 7.0 and mixed formats. At the time when I urgently needed something to work, your product did. So I was happy. Kudos to Rishabh for extra-ordinary customer skills and technical assistance. I will be recommending you to others. MS SQL Server Database Recovery Software!!! Fabulous product fabulous technical support to guide one through the software. Never before have I come across such great service. You are efficiency and perfection personified. I am overwhelmed with the results. How to Bring SQL Server Suspect Database to Normal mode? How to Resolve Microsoft SQL Server Database Error 5171? Looking to resolve SQL Server error 5171 when trying to attach MDF file? Check out the simple methods here!